Hardware and software combine for a great touch experience. Already five years old, Apple's innovative iPad is often dismissed as a device more focused on consumption than creation, despite the wide variety of apps available for photographers, designers, musicians, writers and other creative types. For all the things iPad may be capable of, the tablet isn't running a robust, desktop-class operating system like Mac OS X or Windows, meaning developers are often forced to reinvent the wheel when existing software launches on the device. That gives Microsoft's Surface Pro 3 a major advantage for those who prefer fewer compromises, since it's already running a full version of Windows 8.1 powered by the same fourth-generation Intel Core processors found inside desktop and notebook computers – but with the convenience and all-day battery life of a tablet. 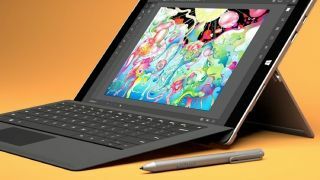 However, what works great with a keyboard and mouse doesn't always necessarily translate to the best experience on a tablet, which is why Adobe recently introduced touch-friendly updates for two of its classic design applications, offering designers the best of both worlds in a single hardware package. Adobe enables drawing or painting with your fingers. Designed for multi-touch gestures and pressure-sensitive stylus pen input alike, Touch Workspace streamlines the design user interface, making it more responsive to fingertips, while optimizing a number of new or existing software tools with touch interaction in mind. Adobe has also implemented support for touch gestures already familiar on other tablet devices. Using two fingers, artists can pinch and zoom or pan around the digital canvas, rotating or scaling objects without a mouse or touchpad; one or more elements can be selected simply by dragging a finger around them. For now, Adobe offers a more fully immersive Touch Workspace experience on Illustrator CC 2014, merely dipping their toes into the touch waters with Photoshop CC 2014, as well as recent updates to motion graphics and video editing solutions After Effects CC 2014 and Premiere Pro CC 2014. Artists can switch from Touch to classic with just a tap. To activate Touch Workspace on Illustrator CC 2014, tap the icon at the top of the screen, or select Window > Workspace > Touch. The user is presented with a streamlined UI that doesn't stray too far from the application's familiar look and feel, but pushes lesser-used tools out of sight to keep the focus on drawing and editing. An exit button in the upper right corner switches back to the classic UI, while the adjacent Touch pull-down menu can be used to jump directly into any of Illustrator's other full-featured workspaces. Longtime iPad users will want to remember to use two fingers (instead of just one) while panning around the artboard – in Adobe's new workspace, a single finger gesture is used for drawing and selection tools, which takes a little getting used to at first. Despite Adobe's best intentions, some traditional tools lend themselves to pen input rather than touch, which lacks the precision of a stylus. But in general, Touch Workspace does a good job of making Illustrator more finger-friendly.